Do you have any questions about ADA and Title 24 Restroom Signs? 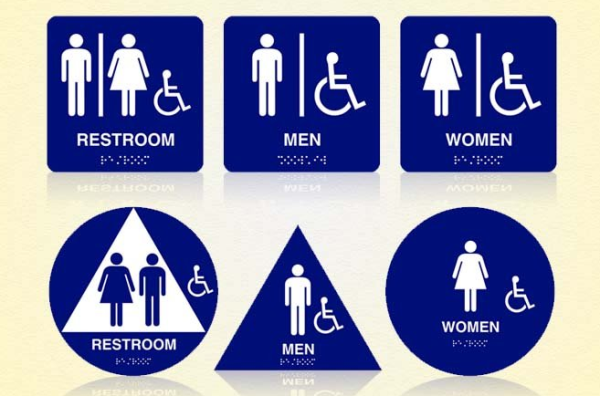 The Sign Studio is your information resource for ADA and Title 24 restroom signs. We realize regulations are difficult to understand and follow, that's why we do the work for you! If you have questions, we have the answers. We will provide you with high quality, custom-designed signs for use indoors or outdoors resolving your questions and concerns about compliance with ISA standards and ADA/Title 24 regulations. 1. We offer raised and braille characters and pictograms. 2. We manufacture our compliant signs in eggshell, matte or other non-glare finishes. 3. We adhere to all mounting location and height requirements. 4. We follow the current International Symbols of Accessibility (ISA) guidelines. 5. We offer unique illuminated signs or convenient non-illuminated. You can trust The Sign Studio to answer your ADA/Title 24 restroom sign questions and provide professional service, manufacturing and installation. We exist to help facilities and businesses requiring assistance with sign design and placement. We can research your questions and concerns. We are confident we can meet and surpass your expectations with our friendly customer service and knowledgeable team. Request a quote today at http://www.thesignstudioonline.com/quote/.